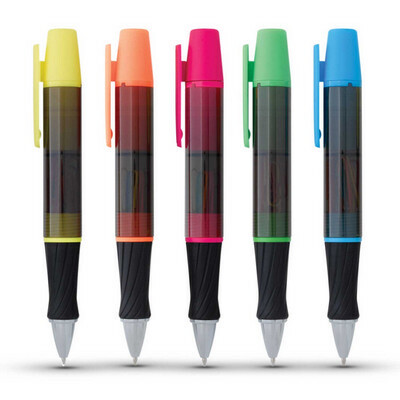 Unique multi-function twist action ball pen with black ink and a chisel tip highlighter on the top. The upper and lower barrels unscrew to reveal an internal compartment with eight paper clips. A lead time of 10-15 working days applies to this product. Colours: Yellow, Orange, Pink, Green, Blue. Dimension: H 152mm. Print Description: 38mm x 19mm (one colour). Print Type: Screen Print. Packing: Bulk. Less than minimum quantities are not available for this item. Price includes : Printing 1 Colour. Setup is included.